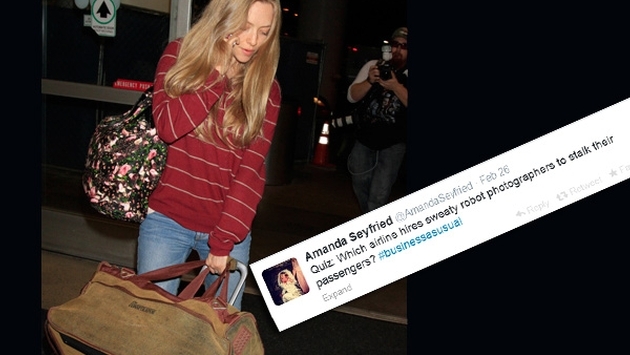 Amanda Seyfried is joining the ranks of many other stars and calling out American Airlines for allegedly mistreating their celebrity clientelle. Amanda claims American Airlines tips off the public when and where celebrities will be. According to FlyerTalk, an airline rep insisted that employees are not allowed to share passenger information. Not amused, Amanda addressed the situation to her nearly 300,000 followers on Twitter. Unfortunately for American Airlines, Amanda is not alone in her fight against the airline. Earlier this month, Kristin Chenoweth was boarding a flight in Dallas when she was reportedly verbally assaulted by an angry gate agent. Chenoweth claimed she was bullied and embarrassed as she tried to board a flight with her dog. The agent claimed she didn't have the right paperwork and became "verbally abusive." Kristin and her emotional support dog, however, were eventually granted permission to board the flight. But that didn't stop the "Glee" actress from ranting on Twitter later that night. “American Airlines: Dallas flight attnt (sic) supervisor Ms. Kidwell. Abuse not okay. #tripfromhell,” she tweeted. Talk show host Glenn Beck is also boycotting American Airlines. In the fall of 2012, one of the attendants on his flight from New York City to Dallas refused to open his drink for him even though he asked politely. Furthermore, Alec Baldwin was booted from his flight in late 2011. The "30 Rock" actor felt he was singled out for using his phone and was asked to put it away, while other passengers were allowed to use theirs. Alec was kicked off the flight after he retreated to the bathroom with his phone and slammed the door. How do you feel about American Airlines? Have you ever noticed any odd behavior on the airline's part? Tell us!